Daniel Madlung is half part of Dandytracks. On our Etui Winter Camp 2 and 3 compilations Dandytracks have combined elements of dub and techno with field recording sounds in their Dubstories About Us. 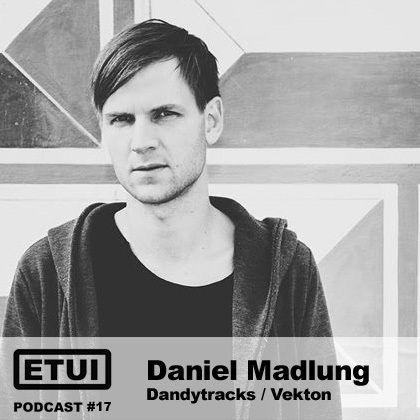 Together with his wife Mandy Jordan, Daniel is also running the minimal house label Vekton. Beside is music works he does also the artwork for Etui. How did you came in contact with house and techno? It was 1995 when I went to a small club called Feuerwache . I liked the DJ’s a lot and wanted to know who does make this brilliant dark music on the records and especially how. How would you describe your music as Dandytracks? Dandytracks is actually a project of my wife Mandy Jordan and me, Daniel + Mandy = Dandy. Since 2011 we have published tracks as Dandytracks . First digitally and later on vinyl only. Mandy is doing a break and has retreated a bit from Djing. Dandytracks music is a symbiosis of taste from my wife and me. This can only describe the podcast. You can hear the full spectrum of the music we love. At the end there is always something organic and dark in it. We do not like “Happy Techno”. How is it compared to your solo project Daniel Madung? I think that the sound of the solo project is more percussive and monotonous. To be Honest, I do not know it exactly. What is the idea behind your label Vekton? The label releases music by artists who inspire us like Mariano Mateljan, Archie Hamilton, Topper, Ferro, Pelle and a lot more. Around 2006 Vekton started as a net-label and later it became a digital label. Since 3 years we are releasing vinyls only. We started a sub-label called Vekton Black in 2012. On Vekton we release only the full artist EP’s and on Vekton black we do special various artist ep’s. The music of both labels is something between House and Techno, I don’t know. The nature as well as the random situations in the studio inspire me. The random situations can come from my modular synth, reaktor sequencers or recorded audio tracks and fields. There are many ways to start new tracks. At the moment I use in my setup a desktop modular synth by Curetronic, Elektron Analog Rytm, Doepfer Dark Energy, Red Sound Dark Star, Doepfer Dark Time, Waldorf 4 Pole Filter, Jomox T-Resonator and 2 Genelec 8040B + Sub. Sometimes I sell everything and try new gear and build a new setup… My DAW is Ableton 9 + MFL and Komplete 9. New tracks on Vekton, Karton and Vekton Black. Maybe also dubby music on Etui ;-) I will also play at Musikfreunde event at Sektor Evolution in May. I like starting with textures only. I´m a fan of switch between the moods sometimes without the classic 4/4 mix and finally leading into Minimalhouse. You can play with this deep sounds in a podcast a bit longer than on a techno party. An idea does not exist, only the music. 6. Baby Ford – Satellite Stroll – Force Inc.